Risk Point on Thursday announced a new estimating model that could eventually lead to claim payouts to dealerships for inventory hail damage being slashed. The company, which insurers auto dealership fleets, said that insurers’ existing hail damage estimating guide is more than a decade old and fails to take into account advances in paintless dent repair, which it says can fix 90 percent of hail damage. “PDR has become extremely common in the past decade, and with improvements in PDR processes and a large increase in the number of PDR vendors, the actual cost to repair a vehicle has dropped substantially,” Risk Point said in a news release. 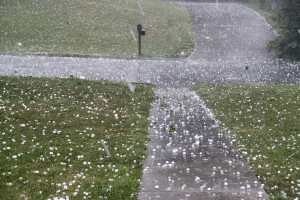 Using the old model overpaid hail claims by $250 million in 2014, nearly twice as much in some cases as Risk Point says. Risk Point said it did extensive research on PDR costs with the help of some national PDR companies. That sounds a lot like a PDR direct repair program, a concept which some auto body shops would argue hasn’t worked out too well for the larger collision repair industry. As if an insurer arguing that somebody shouldn’t profit “beyond the fair and equitable adjustment” wasn’t enough irony, Risk Point seems to be replacing what it says was one obsolete set of hail estimating guidelines with what could soon be another one. Lightweighting is moving full steam ahead, and closures are an attractive target for shedding weight by switching to materials which paradoxically end up being stronger and more difficult to fix. This also leads to remove-and-replace looking more like the way to “fix” damaged surfaces, cutting into PDR business. But even for the surfaces which aren’t replaced, fleet insurers might not experience as much savings as Risk Point thinks. Ducker Worldwide has estimated that aluminum alone will be be 85 percent of hoods, 46 percent of doors and 30 percent of roofs by 2025, and PDR provider Dent Wizard told Car & Driver that the metal — if it even can be repaired — results in a 25 percent PDR upcharge. So there go some savings. And high-strength steel, magnesium and carbon fiber surfaces will be in the mix too. Now granted, all of these materials are stronger than mild steel, which could reduce hail damage and make some of this discussion moot. But it seems like while Risk Point is correct that the majority of hail damage in Ducker’s year 2025 aren’t going to be repaired the way they were in 2005, it’s probably not going to be fixed the same way as in Risk Point’s 2015 model.